If the pink and fluffy car freshener shaped like a dice you got from Auntie Jean last Christmas is losing you street cred, there are other car accessories out there. In fact, there are many little car gadgets you can add to your vehicle to make it even more cool than it already is. Even men driving Kias can turn heads with the best car gadgets in 2019. Kia jokes aside, many different companies are creating convenient and innovative products to go inside your car at the moment. With thanks to new ideas and sophisticated technology, the driving experience is evolving. We’ve got the best car gadgets right here. 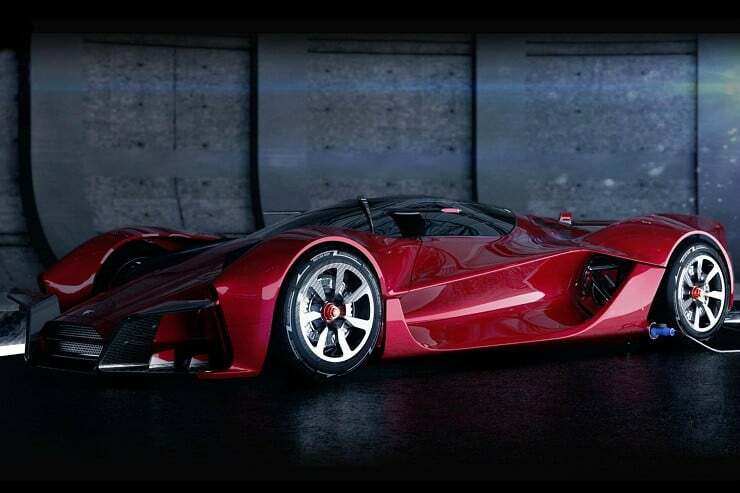 Some of them you will have seen before while others will be a first introduction to new and phenomenal car accessories. We steered our way through many car gadgets that are currently on the market to make a list that showcases the best of the best. We’ve got every man covered as well. From the guys needing a top-of-the-range dash cam to men hunting down an extendable backseat clothes hanging rack, we have the car accessory for you. 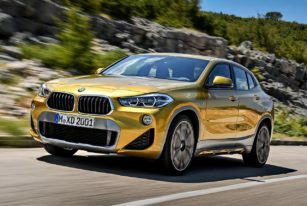 To compose our list of car-related products, we took our time researching through the most popular purchases, but we also threw our GPS out the window and took some unexpected turns to find hidden treasures. So, what are you waiting for? Let’s start the engine and race our way through some of the best car gadgets whizzing up freeways and weaving their way through downtown traffic – seatbelts on and put your scrolling finger down. Oh, and don’t forget a few pitstops along the way to discover more about your favorite products. 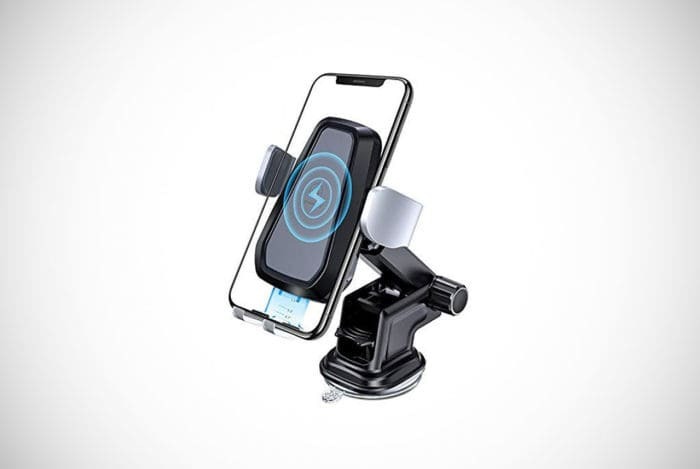 For next to nothing, you can make your drives that little bit more enjoyable with this magnetic phone holder. It features a super cool magnetic surface that can be rotated in any direction. 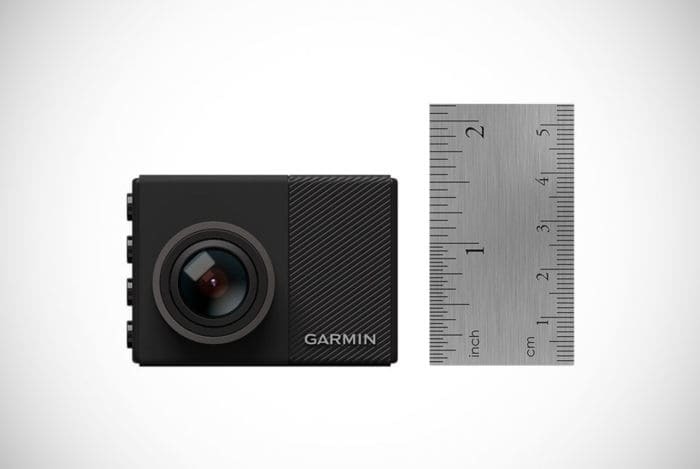 The Garmin dashboard camera sets the bar high when it comes to in-vehicle protection cameras. Not only is this model less than two-inches long, but it can also even be controlled by voice commands. After an incident with a jam donut and a large flat white, our editor has already ordered the anti-slip dash pad from Topfit. This product will keep you organized and your snacks dry! If he’s happy we’re happy. We will kick off our look into the best car accessories with a look at a special smartphone charger made by Vanmass. On many occasions when we charge our smartphones during trips in the car, the wires get in the way and there is no designated place to keep your device. Well, both of these problems become a thing of the past for futuristic men who like their car gadgets. This wireless phone charger from Vanmass uses coils so you can charge your phone without the need for electrical cords. This is clever but nothing too new as such products are available for your bedside table. However, they have added this cool technology to a smartphone holder that clips securely to your dashboard. Now you have easy access to charging where you can see your smartphone clearly – and without the need to tangle your charging cords around the handbrake. Problem solved? When you buy this awesome car accessory you also get lifetime technical support from the manufacturers and a one-year warranty as standard. If your smartphone charger isn’t causing you problems, you may need more organization in the trunk of your car. 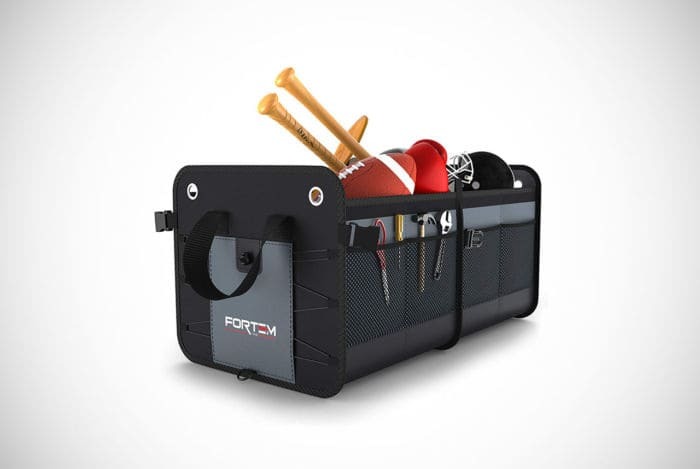 This multipurpose organizer from Fortem does just that. It’s a heavy-duty but collapsible container offering fantastic storage options. You may want to use it to separate your groceries or keep your suntan lotion easily accessible for weekends away at the coast checking out the surf. Whatever your reason to be organized in the back, this car accessory can help you achieve optimum organization. This car accessory has a lot of awesome features. 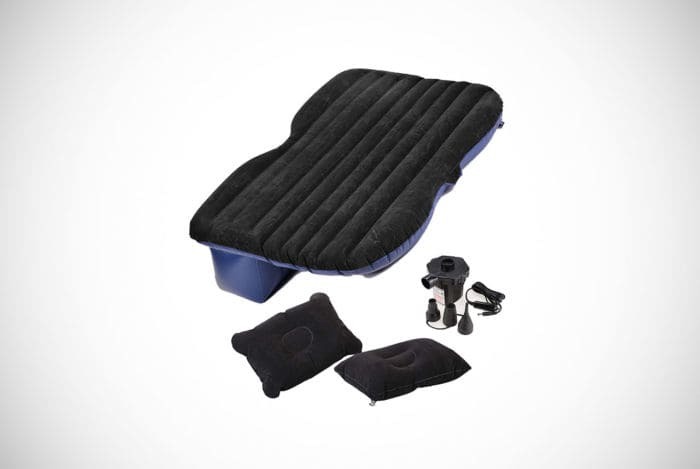 It has non-slip pads to prevent it from moving around as you drive, which also keeps your items secure and safe. It also has side pockets to go with the many spacious compartments. The pockets can be used for different items including smartphones, snacks and more. All pockets are padded or reinforced to ensure it lasts you a long time on the road. Even when it does rack up the miles, you can be safe in the knowledge that it comes with a one-year warranty. Next on our scenic drive through the best car gadgets on the market is a dashboard cam. It’s certainly not the last dash cam you’ll see here, but Toguard have done themselves proud with this model. It’s actually a dual camera which shows a full HD 1080P using the front camera and a 480P rear camera. It even records your drive which can come in useful in the event of accidents and disputes. If there is an accident, this dash camera will cleverly recognize the collision and save a recording of what happened. Yet, one of the coolest features on this dash camera is that it’s a touchscreen model. Less time fiddling with buttons and more time with your eyes on the road when using this product! Another positive with this model is that it has motion detector sensors. This means when you do attempt an award-worthy parallel park in front of the hot girl dining alfresco at your favorite downtown café – you increase your chances of getting some digits. Oh, and you and other vehicles remain unscathed. Find out more by clicking the button below. When your smartphone also has a part-time gig as a GPS system, you can’t always put it in your pocket and take to the road. You end up putting it between your legs, on your lap or bouncing around the drinks holder. The problem with this is that it risks you damaging your smartphone and becomes distracting. Thankfully, Topfit came up with the answer. 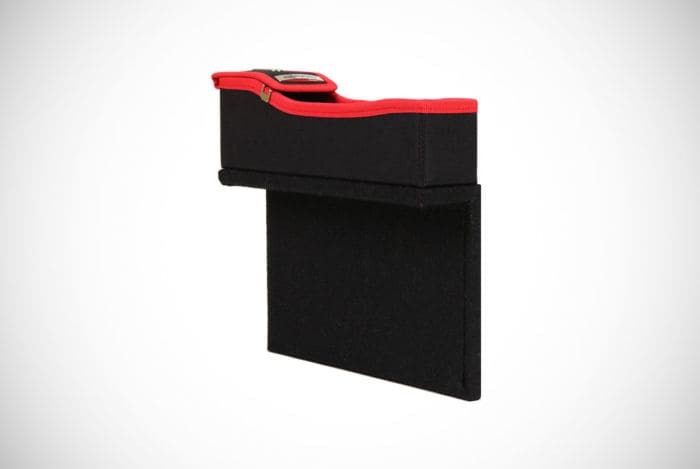 They have created this anti-slip pad that fits on your dashboard. This pad sticks to your dashboard to keep certain valuables secure. 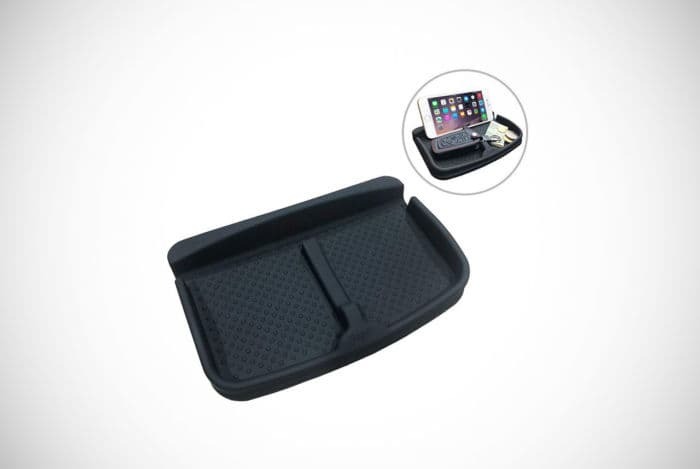 It’s the perfect place to store your smartphone or snacks while driving, as well as a convenient home for garage keys, house keys and other items you may need at an arm’s reach. This car accessory comes in a range of cool colors to choose from and part of its design has been created to work as a stand. So, if you do need to glance at your screen and not rely on voice commands alone, you can use this dash pad as a sort of device holder as well. 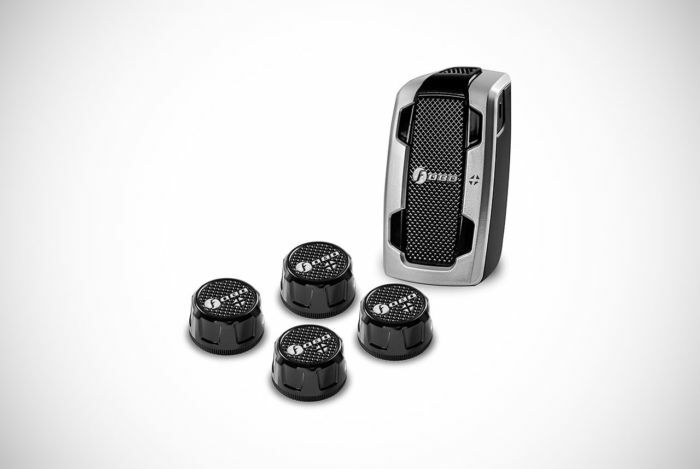 Cars may get you from A to B, but this VeoPlus Car Speakerphone will get you talking to any of your pals in any vehicle, with any suitable device. 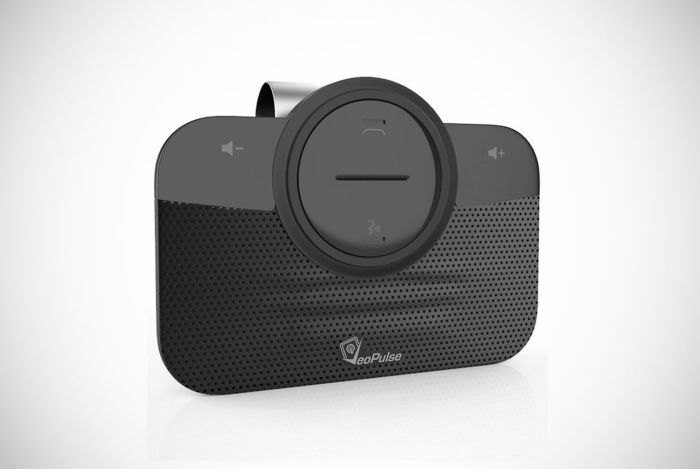 This speakerphone works by connecting to all the popular smartphones via Bluetooth technology. 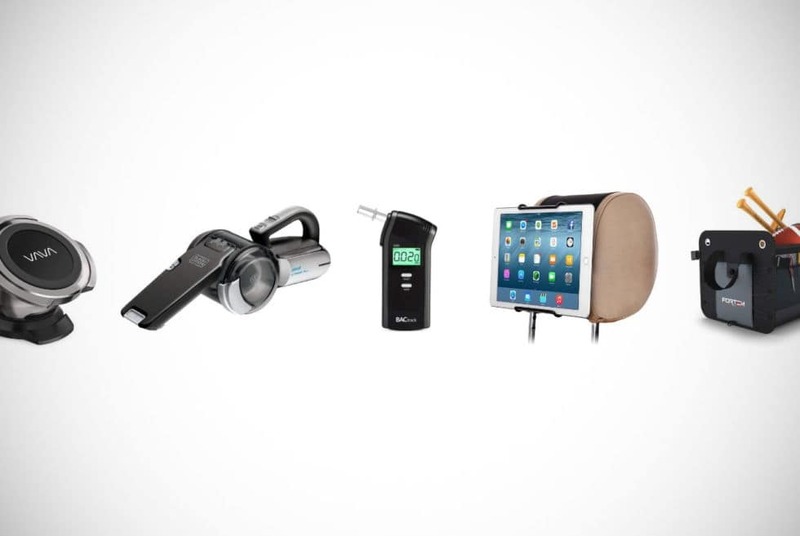 Therefore, this car gadget gets you speaking to the people you want to in a much safe manner. Never risk yours or others’ safety with this Bluetooth speaker that keeps your hands free but always connected. Some of the most eyebrow-lifting features on this model is that it will automatically turn itself off when not in use to save energy. It’s also much easier to install into any vehicle than most men expect. In fact, you only need to attach it to your sun visor with minimal effort and you’ll be afforded legal communication you can count on. VeoPlus also have a constant customer service number and a 30-day money back guarantee in case this product turns out not to be a great call – pun intended! To learn more about this phenomenal car accessory, hit the link just below and discover even more details. The Rova USB Charger is a car gadget that is preventing arguments and making road trips all the more better. Let’s start with the basics. This car accessory offers two different USB ports, meaning it can charge two smartphones at once. 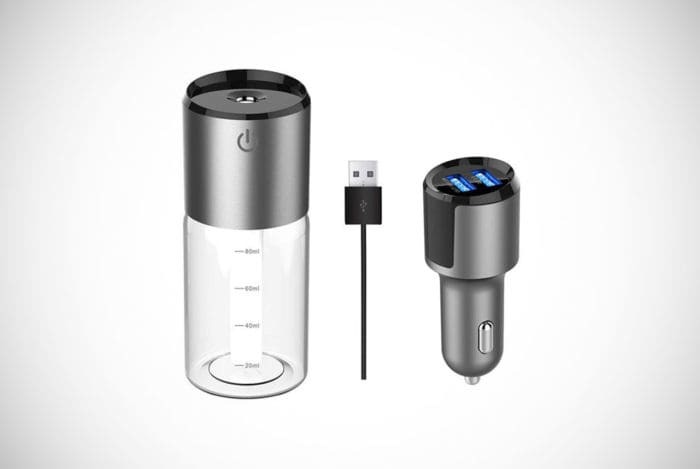 No more battles for the USB port in your car with this peace-making device. Just because there are two ports, it doesn’t mean that it charges at half the speed either. Clever technology has ensured that this model will give both the driver’s and back-seat drivers’ smartphones enough energy, and fast. But there is even more to this dual car charging port. It’s an Alexa product, meaning it can be voice activated. Although you can’t get Alexa to plug your smartphone in, you can do much more. With a simple command, this device will help you play music, listen to a podcast or audiobook, complete hands-free calling, manage text messages, find your way, or even shop online! To give you some extra peace of mind, you can buy this product knowing it comes with a whopping 12-month warranty. One of the most Bond-like car gadgets on our list here is the Whistler Laser Detector. We’re not talking about detecting deadly lasers fired by the bad guys. We’re talking about the lasers let off by speed detectors. Now, we don’t promote speeding here at Men’s Gear and we certainly condone dangerous driving, but most of us have been guilty of taking our eye off the speedometer for a second at the wrong time. Say goodbye to unfortunate lapses of concentration and say hello to never receiving a speeding ticket again. This car gadget offers 360-degree surveillance of your surrounding area to pick up all types of lasers. It will let you know if there is a laser around by giving you both a voice alert and a text alert. This means you can never be put off by your Whistler Laser Detector and will always know when the speed cameras are nearby. It even has different settings for city driving and more rural adventures to prevent instances of false alerts. 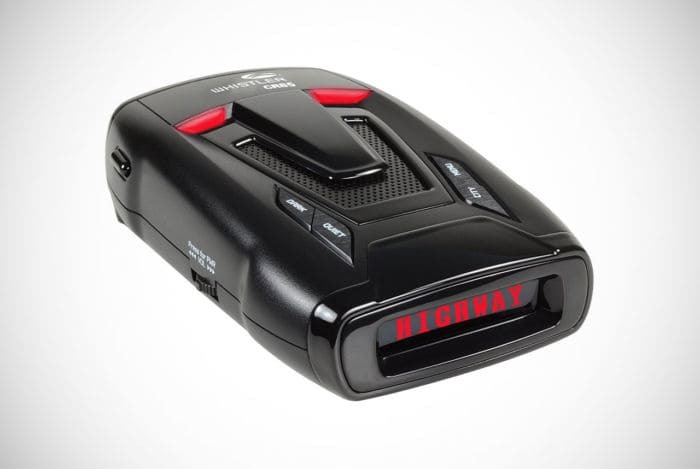 If you let your buddies eat in your car on the way to your monthly fishing trip, then you probably need a vacuum that is the perfect size for a vehicle. 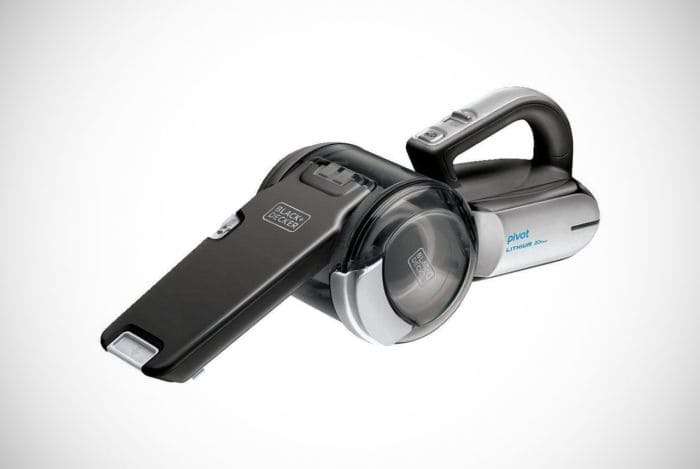 Black & Decker must also have some messy-eating fishing-trip pals as they produced the perfect vacuum to take care of hard-to-reach crumbs – or maybe they’re just parents? The dads among you are nodding in agreement right now. 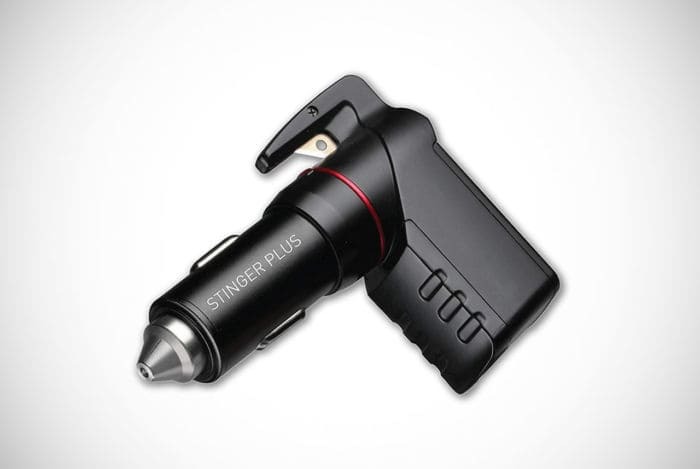 One of the best aspects of this car gadget is its nozzle head. The nozzle on this design is innovative in that it pivots to get into the small spaces beneath car seats and in between the seams of your vehicle’s seats. The filter is also super easy to clean out and can even be washed without risk of damage. Its convenience is only matched by exceptional suction power to give your car a thorough clean each and every time. Find out more about this car accessory by hitting the button right below. If you’re a car aficionado or someone who likes to get a bang for their buck in terms of mileage, you will know that car-tire maintenance is essential. 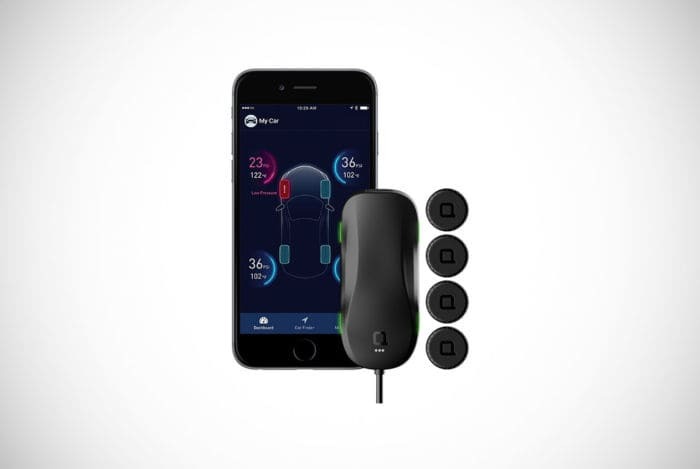 The Nonda ZUS Smart Tire Safety Monitor has you covered with all things tire related. It takes the guesswork out of the current state of your tires by providing real-time feedback on each tire directly to your Smartphone. This car gadget detects any air leaks by monitoring tire temperature (°C/°F) and pressure (kPal/PSI/Bar) changes, prewarning you about potential tire blowouts. The monitor also keeps a record of the measurements of each tire, saving you time by allowing you to schedule gas station stops for air or future car maintenance. Not only will it save you time and money when it comes to your car, but it’s a relatively easy device to install. It takes approximately 10 minutes and three easy steps. Its compact design means you can take it with you on holidays or transfer it across to the family car. By using the ZUS Smart Tire Safety Monitor, you will ensure a return on investment with properly pumped tires by saving up to 11 cents per gallon. Now that you know how much extra distance you will gain on any set of tires with this car accessory, why not go on that long-awaited boys’ road trip on Route 66 or across Europe? Want to pretend you’re on a fancy plane with every road trip with the gang? If you’re a family man or you travel around a lot with your buddies, you will know that those in the back tend to get bored easily. 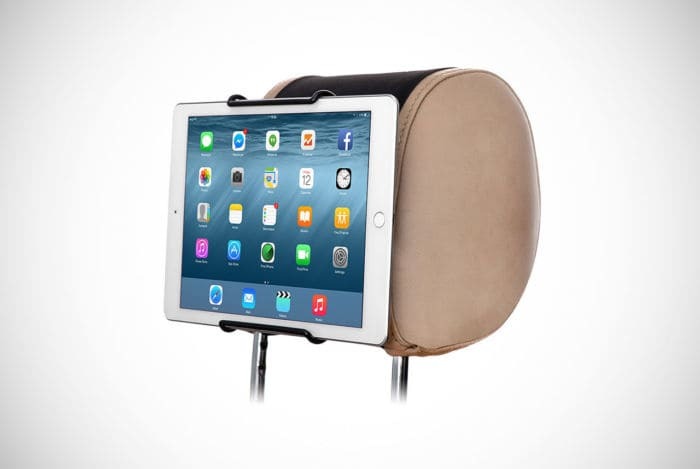 So why not distract them by providing the perfect car accessory – the TFY Universal Car Headrest Mount Holder. This compact and travel-friendly holder works with all 7-inch to 11-inch tablets. Specifically designed to allow for devices that are with or without a protective case, and with simple detachability, you’ll find your kids detaching it from the headrest with ease. No matter who the backseat rider is, this car gadget has you covered for short and long car trips, and even the odd flight or train ride. This sleek car accessory can be compacted even further by folding it up for storage in your luggage bags for rental cars or on plane serving trays. It’s an unobtrusive accessory that secures safely to your car, so you can avoid damaging it when you getting the kids out of the car. To top off an excellent car gadget, the manufacturers offer all customers the opportunity to get a refund within 30 days if you’re not completely satisfied. 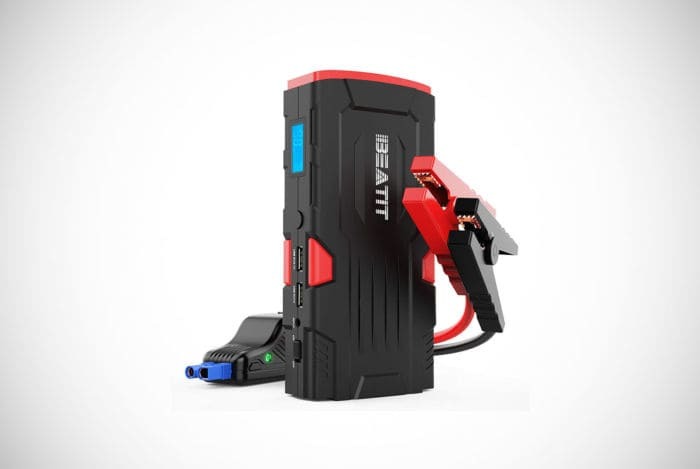 The accessory of car accessories when it comes to charging your car is the Beatit D11 800A Peak 12V Portable Car Jump Starter. This car charging accessory has the capacity to jump-start unleaded, diesel (up to 5.5L) and gas (up to 7.5L) cars. With two USB outlets of 5V, you can lend a hand to those in need by giving a jump start or charging personal devices. It can be used for camping, traveling, hiking, emergencies and for everyday use, making it the ideal car accessory to have at hand. On a single charge, this compact and portable lithium battery has a jump start rate of 30 jump starts. The simple design features an LED screen to observe the remaining battery power, it also features an in-built 100-lumen flashlight with three flashing settings (including S0S flashes), making it easy to see day and night. Containing spark-proof technology, reverse polarity protection and a mistake-proof design, this car gadget can be attached safely to almost any battery. Come rain, hail or shine, you will be able to charge your car or devices with this awesome car accessory for men. 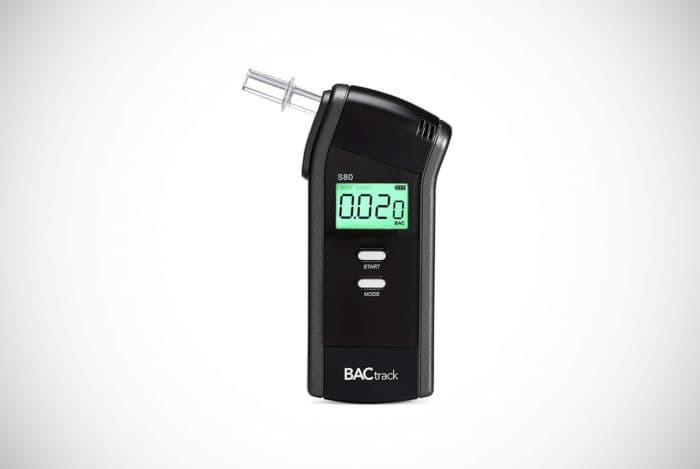 There is a really cool story behind the creation of the BacTrack S80 Breathalyzer. 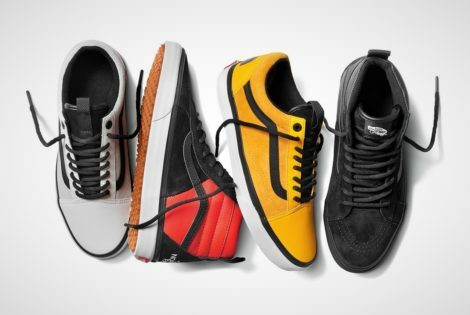 The manufacturers conducted over 60 hours of in-depth research to piece together their final design and within those hours included getting drunk down the cop station. 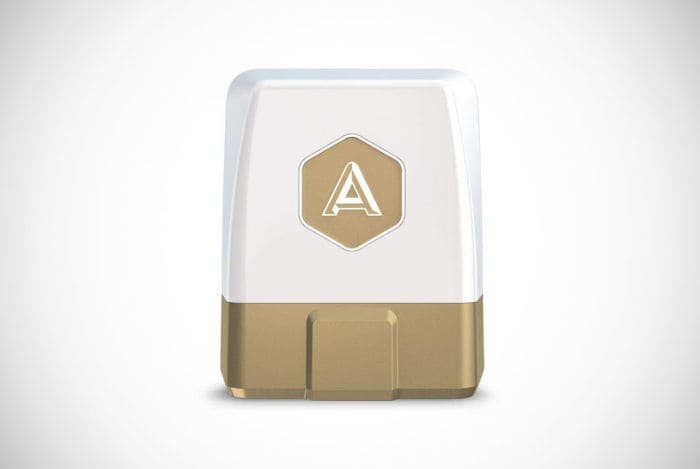 The final product – aside from some hangovers – is a car gadget that will evaluate your alcohol levels with the same precision as a medical-grade device. That’s right, this model has the same accuracy used by your local chief and your local doc. The product has been made to be simple to use. So, despite it being of the same quality that your local practitioner is using. There’s no seven-year degree needed to operate it. With one button and a blow on the mouthpiece, you get your results swiftly. 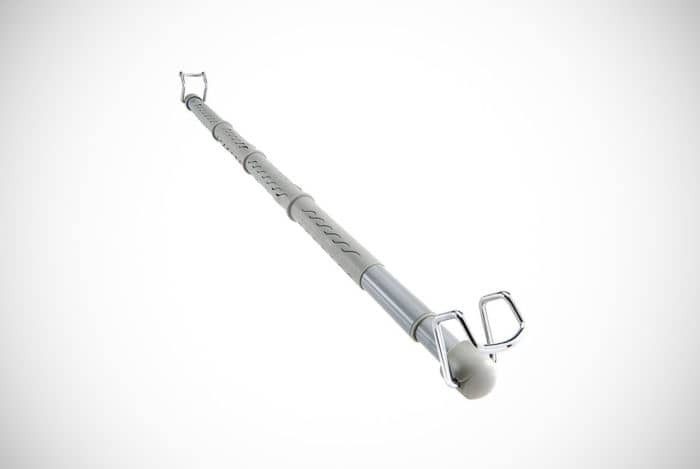 Other things you should know is that this model has passed the relevant tests with the FDA. It also comes with a one-year warranty. Keep yourself and your passengers safe with this must-have car gadget for men who like a beer! 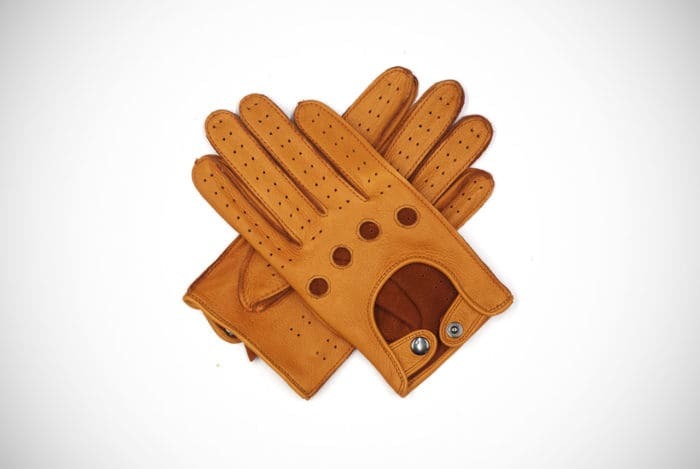 These may be a more niche request from our motorist readers, but leather driving gloves are cool and you’ll look all the more awesome when driving in them. These gloves from Harssidanzar are some of the best you can get your hands on. They come in a range of color options and slightly different material options. This featured design is made from 100% sheepskin leather that feels as good as it looks. They have been made with comfort as their priority. They have added grip and a rotating finger area so you feel free and in control at all times. This natural anatomical shape achieves a comfortable feeling where other driving gloves fall short. The gloves also house a number of ventilation ducts to make them exceptionally breathable. So, even on long drives, your hands don’t get clammy and you never lose control. These gloves come with a lifetime warranty and a satisfaction guarantee to give you additional peace of mind. A car tracking device may sound like one of the best car gadgets for a secret agent. But even if you’re not leading a double life there are lots of reasons that you should buy this awesome car accessory. This gadget will link to your smartphone via a secure app. From here you always have real-time information to the whereabouts of your vehicle. It may be the perfect car gadget for men who want to protect their valuable vehicles, but it comes in useful in other scenarios too. It also has a crash detection system so if you are in an accident the device will automatically notify the emergency services. It pairs with Alexa, Nest and similar products to streamline your digital items together. It’s also useful for business owners that run a fleet of vehicles. This car gadget tracker will record mileage, so you can monitor how staff are using your vehicles. To top off a cool product, this item comes with a five-year 3G subscription. If you suddenly don’t need your sunglasses for driving, you might be struggling to find a secure place to store them while on the road. Resting your delicate and expensive sunglasses on your lap or between your cup of coffee is not an ideal or secure solution. What is a solution is the sunglasses holder made by Superior Essentials. Yes – plural! 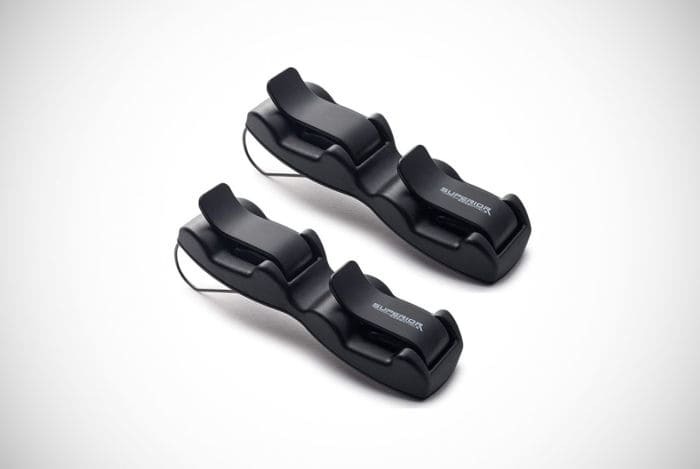 This holder can hold two pairs of sunglasses at once – so you and your favorite passenger is catered for. It’s really easy to store your sunglasses securely and keep them accessible in case the clouds clear. Simply slide the sunglasses in or out of the slots provided. What is really cool is that this car accessory will slip onto your sun visor, meaning they are always at an easy reach when needed. You can even choose to buy this item in a two-pack to save an extra few bucks. One for you and one as a gift? Every man who owns a car should also own a dash camera. These cool car gadgets can ensure you have valuable evidence in the case of car accidents, other incidents or attempted break-ins to your vehicle. The Aukey Dashboard Camera is one of the best, but why is that? It has a discreet profile because it sits behind your rearview mirror and can easily go undetected by unsuspecting criminals. But this is also convenient as it doesn’t obstruct any of your view of the road. 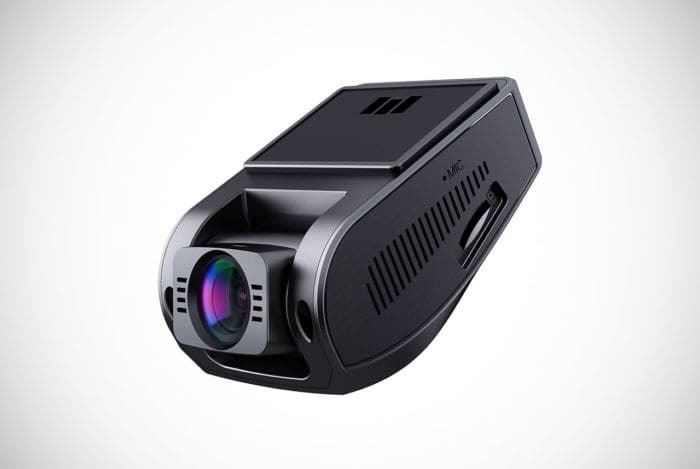 It has a 1080p camera that is not only sharp enough to capture the smallest details, but it also offers an impressive 170-degree view. All lanes are kept on camera with this car gadget. It can even detect an incident through disturbances to its gravity sensor. When it does sense an accident is occurring, it records the incident automatically. Whatever the temperature and whatever time of day, you can count on this car accessory. 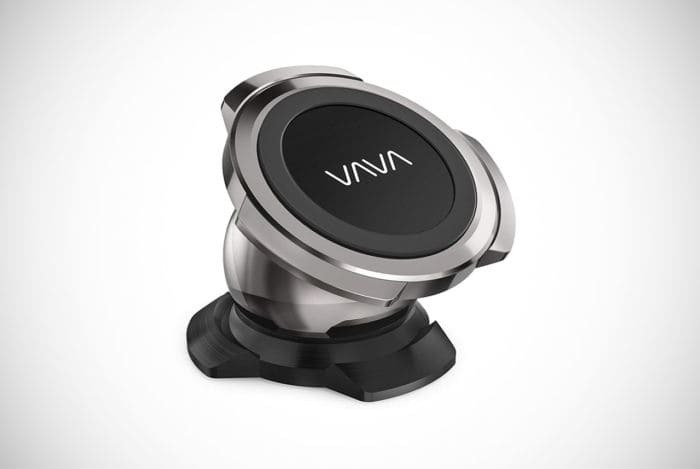 Never let your phone slide around your car while driving with the super awesome Vava Dashboard Magnetic Smartphone Holder. We’ve all been in a scenario where we leave our smartphone on the dashboard and it suddenly does some traveling of its own. Or we leave it near the handbrake and it comes in too close a contact with our coffee and hard surfaces. Instead of risking your costly smartphone case or screen, get a convenient smartphone holder instead. This cheap car accessory is completely innovative and unique. It uses a strong magnet to keep your smartphone hovering at the perfect angle. The design allows you to still consult your phone in a hands-free way to look out for GPS directions. This is because the magnetic platform can rotate a full 360-degrees. Available in many colors at an affordable rate, choose this car accessory to make driving that little bit nicer. The product is supplied with a 30-day-money-back guarantee. 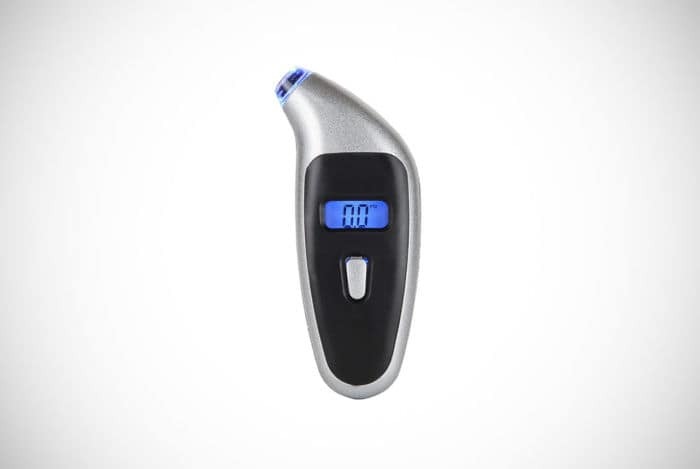 To learn a little more about this phenomenal gadget, simply click below! 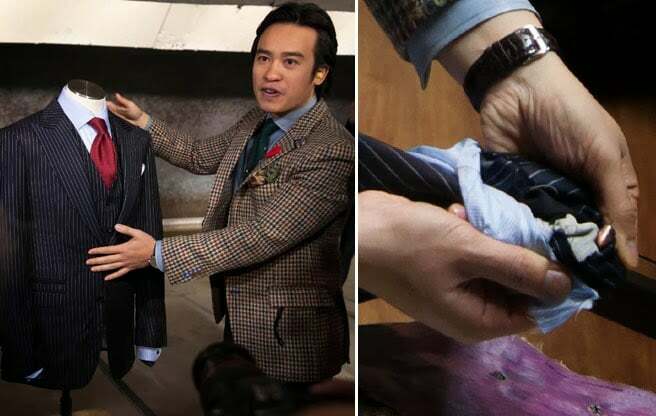 If you’re a businessman who prefers the open roads to the open skies, or a traveling salesman, then you will know the problems of packing suits and formal attire into your car. Well, instead of turning up to your next gig with a creased suit and pants with an ugly fold line in, you could get a backseat clothes hanger like the one from High Road. This car accessory is made of a reliable metal construction that can take the weight of any suit. It also fits into the back of any vehicle because of its extendable design that spans across the roof of any narrow or wide car. It even comes with rubber dividers, so your clothes stay hung in their original position – even after taking a sharp bend. One of the nicest things about this cool car accessory for men is that it’s easy to install and only takes a matter of seconds. To learn more about your next backseat wardrobe, shop at the button below. We’ve got a few sophisticated tire pressure monitors on this guide looking at the best car gadgets for men. However, we like to keep things equal and show some lesser items that also do a great job for less money. 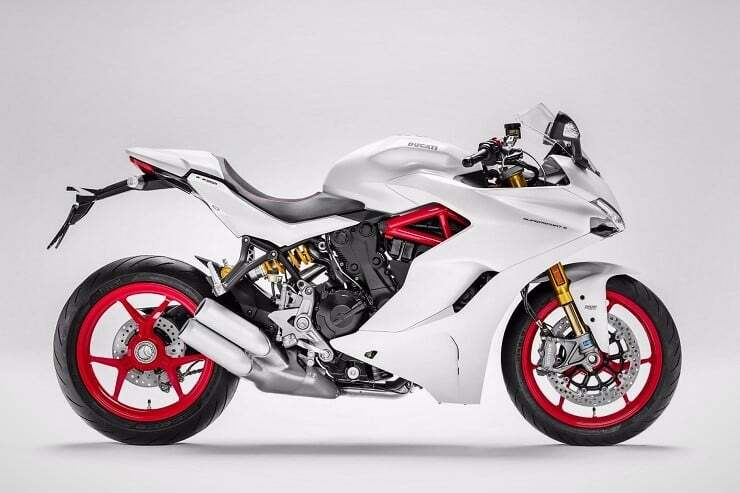 This is why the Ionox Digital Tire Pressure Gauge has made it onto our showcase. If you want to make sure you add air to your tires in a timely manner, then you need one of these car accessories. Keeping your tires well maintained is key to making them last longer. This car gadget comes in black or silver and is constructed with heavy-duty metal casing. This is built to last but if it doesn’t or you’re not completely satisfied then you can get a full refund from the manufacturers. It’s also very compact so you can store it in your glove box. When you do need to use it just hit one button, choose the type of measurement unit you need then clip it to your tire. If it’s late in the evening, you can also use it easily because the nozzle features an LED light for low-light use. 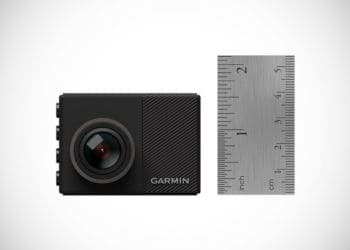 If you want the same dash camera as *insert your favorite spy agent*, then you probably want the Garmin Dashboard Camera. A dashboard camera comes in useful to record what happens on the road to keep you protected. This evidence of your version of events may be key after significant incidents and could even be used in court. Is there a better reason to get a pristine image from a dash cam? We think not. Well, there might be one other reason. They come in useful to record thieves trying to break into your car. The Garmin model is exceptional in this department because it is extremely discreet. In fact, this car gadget is less than two-inches tall. It’s a tiny camera that is always in stealth mode. Other cool features include a 180-degree view with a 1080p resolution camera. Yet, one of the most attractive features is that this camera can be operated with your voice. Simply tell it to take an image of the car in front or start recording – and it will obey. We know what you’re thinking. How was one of these not invented decades ago when cars started roaming our towns? We agree. It’s been a long time coming for someone to find a solution to loose coins rattling by the side of our seat, or in car door handle spaces. Well, at least KMMotors have made the best car accessory to tackle this annoying problem now. They’ve even designed multiple versions for the driver or the passenger and models with and without a cup holder. You can even get one with a touch of red to make the accessory even more awesome. However, this design isn’t just great for keeping your coins in a secure place – rather than falling beneath the seat mid-drive. You can secure your smartphone, leather wallet and more with this fantastic car storage option. It’s great for vehicles of different sizes, so what design will you get? Every man that goes on camping adventures or fishing trips will need this next car gadget on our guide. 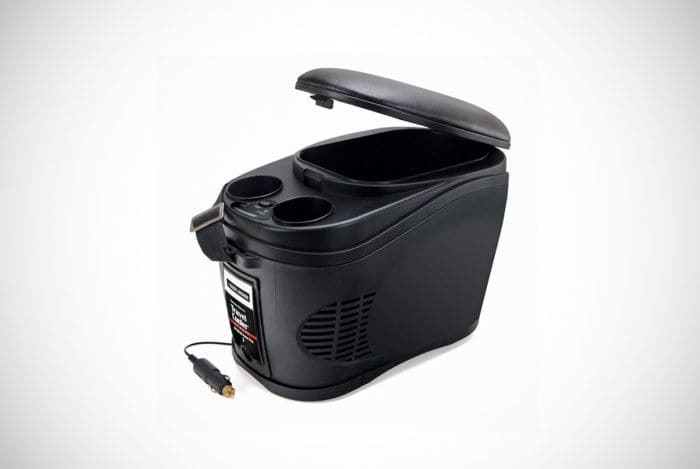 This is a travel cooler and a travel warmer that is specifically made to go inside your car. Kick back on your drive knowing that you have your very own road trip or campfire essential with this Black & Decker product. The product can hold around 2.3 gallons of liquid, which is about 12 cans of beer – we tested it. With the effortless flip of a switch, you can cool the contents of this car gadget to the point where no ice is needed. On the other hand, you can keep your coffee warm on the commute to work. Whatever the season or occasion, this travel car accessory can help. Specifically, the product has cup holders, a convenient carry strap, zippered pouches, accessory storage options and more. It plugs into your lighter point inside your car (or on a boat if you have one) but it will not drain your battery. The product will automatically recognize when you have turned your engine off so it will simultaneously turn down its consumption. One of the car gadgets that can turn any old vehicle into something space-ship-like is the Sherox Head-Up Speed Monitor. One of the little annoyances when driving is having to flick your head down to check your speed every few seconds or minutes. That annoyance never has to happen again for owners of this car accessory. Sherox has come up with something relatively simple but something that is revolutionary at the same time. 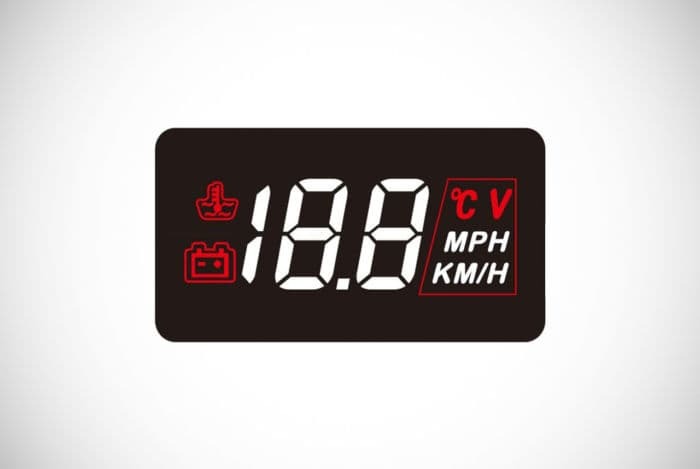 Their gadget will display your speed and reflect that speed onto your windscreen. This way you never have to repeatedly lower your attention away from the road to consult your current speed. It even has some built-in alarms to notify you of certain things. It will notify you if you are traveling to fast or if your water temperature is too high. For convenience, this car gadget will automatically power on and off at the same time your vehicle does. Ever feel like you can’t manage to eat all your snacks in a non-messy way on a road trip? Mustard down your chin and chips all over the footwell? Well, Zonetech has come up with the perfect solution for you. 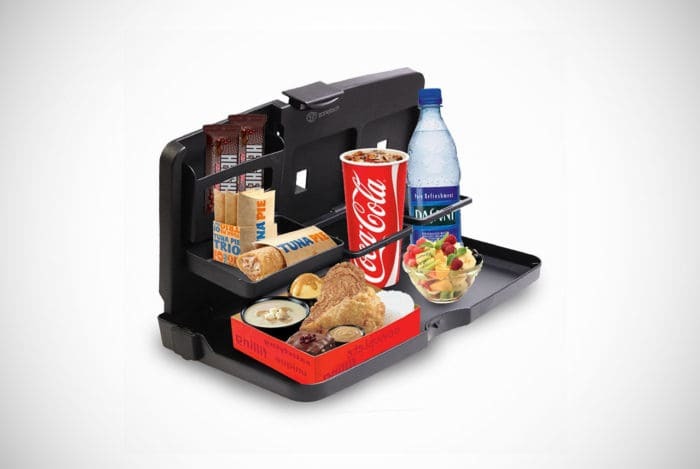 The Zonetech Travel Food Drink Tray will stop any sauce spills or the desire for your coffee to meet your new shacket. With two cup holders, a mini-shelf system, a small pocket and a sizeable flat surface, you can keep yourself well fed or store your devices and entertainment within easy reach. As an easy-to-install car gadget, it ties around the headrest frame, avoiding your head and keeping your back passengers happy. When not in use you can fold it down, ensuring no knees are hit as people get in or out of your car. Combine this with the headrest we mentioned earlier, and you can enjoy your entertainment at the same time as munching down on your favorite car snacks without making a mess. What time’s the game on? For the guys cruising around the hotter states with broken air conditioning, you might want to check out this handheld fan from VersionTECH. Naturally, we don’t promote this car accessory for you to hold as you switch lanes and navigate traffic. This fan can be securely placed in various locations of your car to offer optimum cool airflow. It may also be held by your passengers too or placed in front of the family dog. 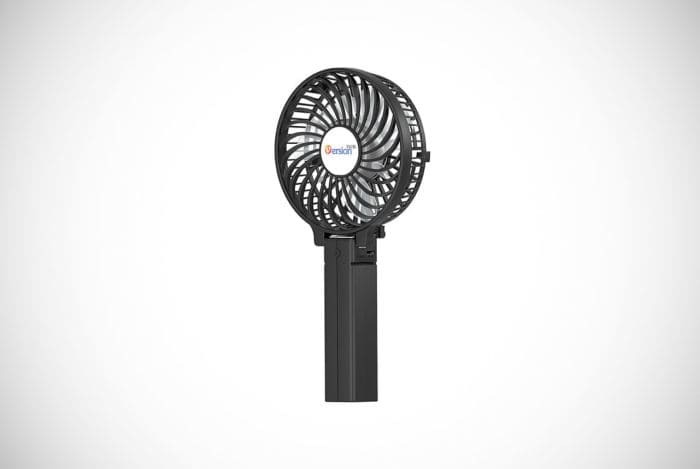 The fan is exceptionally compact and much smaller than many buyers realize. It makes for the perfect car accessory for vehicles that are on the smaller side. If you have a roller-skate-like car then this product will certainly still work for you. The folding handle makes it even more portable and you get a choice of five awesome colors to match your car when buying this item. Think you’ve found the solution to your broken air-con? Find out more by hitting the button below. The retro look is in and coffee has never gone out of fashion. This means only one thing. The TechTools Heated Travel Cup is the perfect car accessory. This product is a cup that keeps the contents hot through thermal heating. Simply plug it into your car’s lighter port and drive to work without letting your morning cappuccino going cold. You can even see how hot your liquid is by checking the temperature gauge on the side of the mug. The analog indicator tells you how far along the heating process is, so you can start drinking at just the temperature you prefer. The cup has been designed with a non-slip rubber base to prevent the cup sliding and falling over. This product comes with a 12-volt charger made for the car. In fact, this product is only recommended to be used in a vehicle. With this car accessory, you will be the talk of the office when it comes for your turn on carpool week. Us men aren’t the first to usually buy car accessories for the purpose of nice aromas. But after your weekend away camping with the boys and getting a little too close to Dave’s feet, a nice-smelling car will be more than welcome. Instead of digging out the standard car fresheners, there’s a car gadget that will do a better job and one that looks a lot cooler. We’re referring to the Dorimi Car Air Purifier. It has a 100-milliliter capacity and can be set on two different functions for intermittent or continuous spraying. On either operation, it will work with extreme quietness to not disturb your conversations or startle you while you’re driving. Specifically, it operates at 28 decibels which is about the same level of noise as someone turning a page of a book. You won’t even notice it. To use it you fill the diffuser with water and add two or three drops of essential oils. This is not just great for clearing the car air after a fishing trip but it’s also effective at combatting colds, coughs and dry lips. 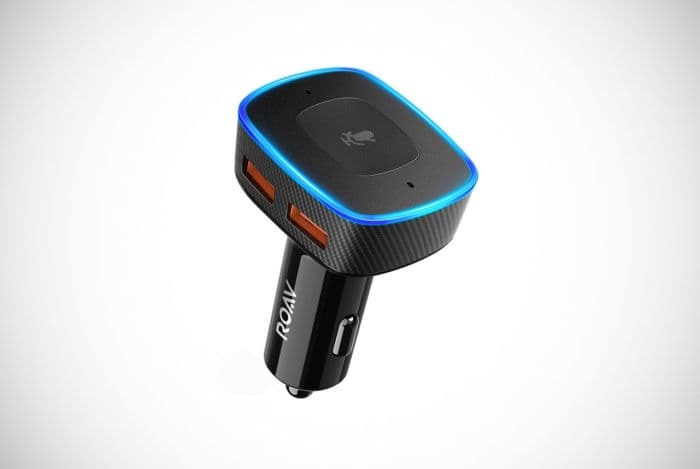 As this car gadget sits in your lighter port, the manufacturers have cleverly added two USB ports to it, so you can still keep your smartphone or GPS on charge as you drive. It isn’t just convenient either. Dorimi have considered the device’s safety by making sure it powers off when the water has been emptied. Every man should have an umbrella. But should every man’s car? The answer is yes after discovering the Reliancer Car Umbrella. This car accessory has a number of cool functions that add more convenience and style to any man’s ride. So, let’s discover a little more. The product from afar is a big umbrella-type design that covers your car. This is great to protect your car from falling debris such as leaves and twigs, falling bird mess and it keeps the sun’s rays out of the car and stops it turning your vehicle into a pre-warmed oven after work. It’s made from 100% polyester which makes it exceptionally waterproof and super easy to clean and maintain. You can also choose to get the model in an automatic or semi-automatic design. Oh, and there are color options to match your current vehicle! This car accessory may be so cool we know what you’re thinking. There will be criminals waiting in the wings ready to steal it while you’re parked in the city. 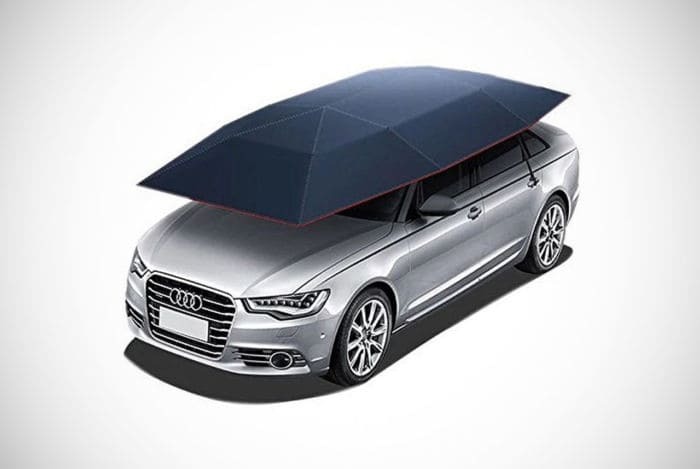 The manufacturers have considered this and added anti-theft ropes to prevent anyone from being able to take this car umbrella easily. They have also considered the wind and made the product with accompanying ropes to keep it down even when the gusts get up. Despite the size of this car tent, which will cover even larger vehicles such as SUVs and pickups, it can be put up in a phenomenal eight seconds and detracts in just 30! Struggling to find a car space near the best coffee hideouts? 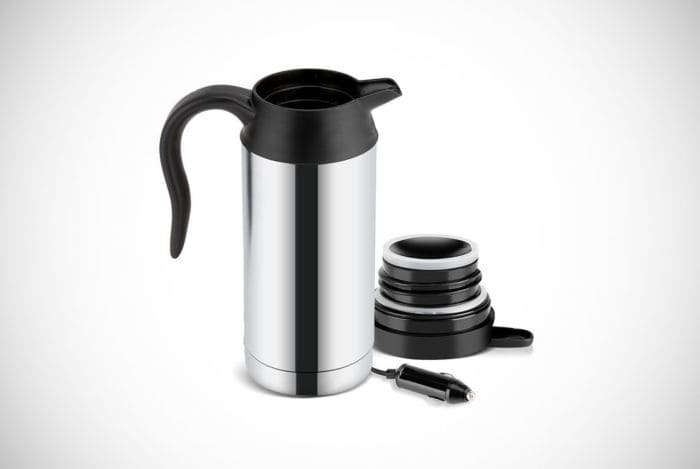 Never mind, you can now bring the café to your vehicle with this car kettle from SoarUp. This is one of the most sought-after car gadgets for men who work in busy city areas and struggle to make a stop-off in time for work. 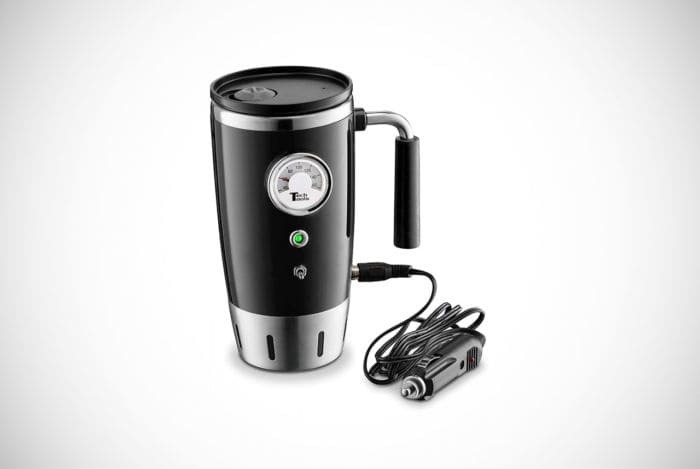 This car kettle is plugged into your lighter port and reaches boiling point in just 25 minutes. Once the content has hit this mark, the car gadget will then automatically power off for safety. But you don’t have to keep checking on it. The car kettle will let you know when it’s done with a traffic light system. 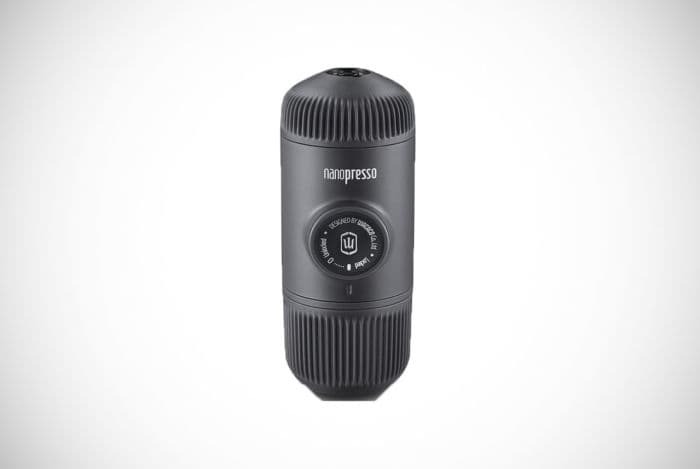 The product has a capacity of 750 milliliters, so you and your passenger get to enjoy a hot beverage without having to search for a gas station and settle for below-par coffee. This car kettle has been made with supreme materials that don’t influence the taste of your drink and make it durable. Moreover, these materials are easy to clean and maintain. SoarUp has opted for food-grade 304 stainless steel with a solid plastic in parts. One of the biggest issues with kettles is that they sometimes leak near the lid. A car would be one of the worst places for this to happen, especially while driving. Fortunately, that won’t happen with this car gadget as it has been made with a lid that is completely sealed. One car gadget that you may never have thought about before is an escape tool. Being in an accident is not something that many of us plan for. Yet, it can happen through no fault of your own. In worse accidents, there may be an immediate need to get yourself and loved ones out of the vehicle fast. That’s where the Ztylus Vehicle Escape Tool comes in. This handheld device has two efficient functions to free passengers who are trapped after a car accident. That is not to say that it couldn’t be used for other purposes. Within the tool is a razor-sharp blade capable of cutting through seatbelts quickly. It will free passengers who cannot undo their seatbelt themselves for whatever reason. The second function of this phenomenal safety device is a glass breaker. It has a dual-stage spring-loaded punch to safely break glass in an effective way. Both tools make for the ideal vehicle-escape tool but both tools are suitable for uses outside of the car. One nice addition on the product is that it can be plugged into you lighter slot and features two USB ports. This means when it’s not saving lives it is reenergizing your smartphone, your tablet or your GPS system. You can buy this escape tool in two great colors at an affordable price. Sold? Maybe you planned on sleeping in your car? Or maybe you didn’t invest in a quality camping tent? Either way, you should take a look at the FBSPORT Backseat Mattress which has been specifically designed to go in a car. If you’ve ever slept in a car before then you will know how uncomfortable it is. Well, you can now get a fantastic night’s sleep with this car accessory. You could always use it for other things such as camping, festivals or for when people stop over at your place for the weekend. However, this inflatable mattress has been specifically tailored to go in the back of the car. How you ask? Well, it has been made with an extra cushion in the middle to protect you from the protruding middle section of the car. You can get this car accessory in either a dark blue or gray color to match your interior too. Traveling businessmen can now save on hotel rooms every now and then with this comfortable inflatable car mattress. When hitting the road for a trip with the kids – and more likely the big kids – there’s a good chance you will need a first-aid kit. Whether it’s your little one trying to catch frogs or big Dave trying to recreate Alex Honnold’s free-solo climbing techniques, there is a good chance that you will need some first-aid supplies on standby. 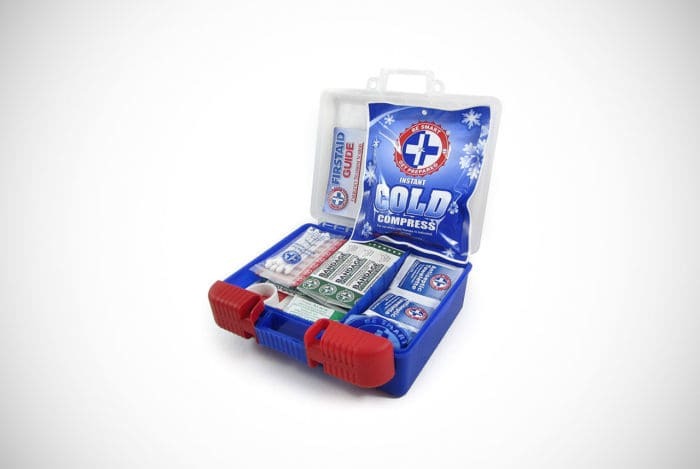 Well, the TRI First-Aid Kit is a USA-made pack that contains more than 100 pieces of first-aid essentials. It has passed all the FDA standards and is proven to be the best way of safeguarding against minor and major accidents. To keep the contents safe, the kit is provided in a protective high-density plastic casing. Find out more by clicking below. We featured a car gadget to monitor your tire pressure earlier. Yet, that one has fierce competition with this similar product from FOBO. The pack comes with four awesome trackers which do exactly what you would expect. They monitor the pressure of each tire, so you know when you need to add more air. It removes the guesswork out of a task we often have to guess a lot – unless stopping at a gas station to get on our knees and check with the tire pressure device. What is really stand-out about this car accessory is that the information can be relayed to an app on a smartphone. The app in question is applicable to most Android and iOS devices. On the app, you will find an easy-to-understand interface which gives you real-time information about the state of your tires’ air pressure. You can then use this information to make timely visits to a garage or gas station. A single download of the accompanying app is capable of capturing the details of up to 19 vehicles! Picture the scene – you’ve arrived at the office car lot and you’re about to go in. However, instead of fighting for kitchen space with Bill from Marketing and Julie from HR, you can have a nice and peaceful espresso from the comfort of your car before taking on the day. That’s exactly what’s on offer with this cool car gadget from WACACO. They’ve answered the needs of many men who drive long distances, those who don’t like to pay for overpriced coffee in the urban jungle, and for campers. They’ve done this by creating a portable espresso maker which is perfect for vehicles. Just don’t do your best barista impression while you’re on the move. The product works with all types of ground coffee beans and has a decent water capacity of 80ml. It’s super light and it even comes in a choice of four cool colors. That brings us to the finish line of the best car gadgets and car accessories currently on the roads. With any or a mix of these car gadgets, you’re certainly moving up a gear with your vehicle game. Which ones did you prefer? Why not take a more in-depth look at the ones that caught your eye to see if they deserve a place riding shotgun with you soon? We’ve covered many different types of car accessories here. 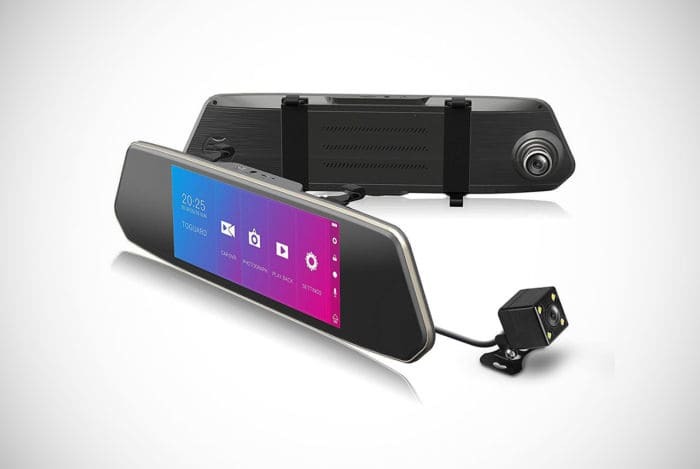 From products that will stop your phone sliding along the dashboard to dashboard cameras that capture your drive in a pristine resolution with voice activation. We’ve also shown multiple types of the most popular car gadgets so different guys find what they are looking for. Not to forget that the models above come in at different price ranges so there is something for every man with any budget. Our research and showcase of the best car accessories may be over for now, but that doesn’t mean there aren’t other awesome car-related products to be discovered on Men’s Gear. Come back to us soon for another ride. We always guarantee to have the most sought-after gear that every man should at least consider owning. Engines off.